1. Upload and extract registrar module into your WHMCS. 2. It's time to enter integration code. Open 'additionaldomainfields.php' file located at 'includes/additionaldomainfields.php' . Paste the code you received at the end of the file, right before '?>' , as shown on the following screen. 3. Go to 'Setup' → 'Products/Services' → 'Domains Registrar' , find module you have just uploaded and press 'Activate' next to it. 4. 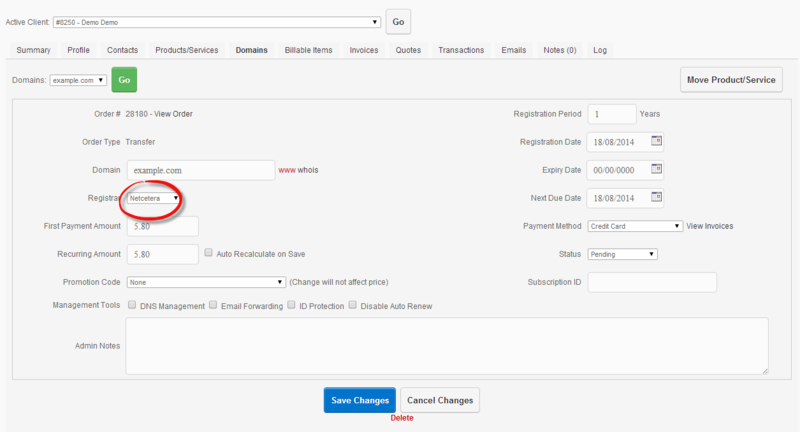 Now, press 'Configure' button, enter 'User Email' and 'API Key' provided along with module. Afterwards, press 'Save Changes' . 5. To continue, go to 'Setup' → 'Products/Services' → 'Domains Pricing' . It will open in new window, so make sure your browser will not block it. 7. Next, enter prices for specific actions. When you are done, press 'Save Changes' . You can start using registrar as soon as you add credits to your account on provider WHMCS. If you order domain using this registrar, you should see in your admin area something similar to the screen below.